Sony has been quite busy the past two years in fleshing out what is still the only full-frame mirrorless camera system. The latest addition to this growing set of the cameras is the impressively specified A7R II. The A7R II follows up the very successful A7R by giving it the same upgraded body style that premiered on the A7 II this past winter, giving it an all new back-side illuminated 42 Megapixel sensor with 399 phase detection points, in-body image stabilization and internal 4K video recording. While it seems like the ultimate camera on the spec sheet, is the hype greater than the reality? In this Sony A7R II Review, we’ll find out. If you’re not familiar with my reviews, I review from a real world shooting perspective. You won’t find lens charts or resolution numbers here. There are plenty of other sites that cover those. I review products on how they act for me as a photographic tool. 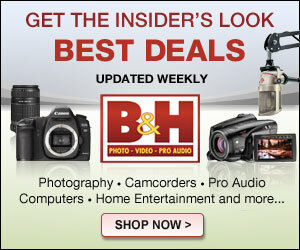 I am not a videographer, so my reviews concentrate on the still imaging capabilities of a camera. Due to the identical body styles and similar feature sets, some portions of this review are taken from my review of the A7 II. 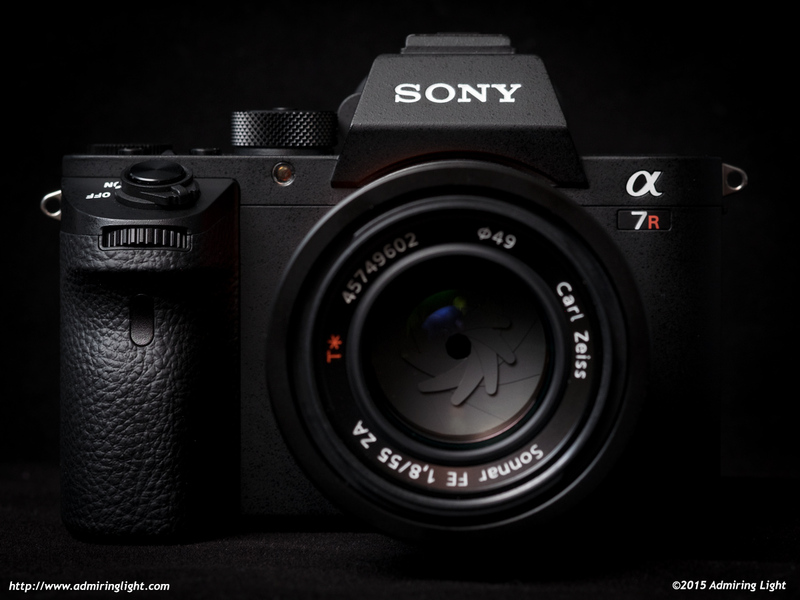 The A7R II has received the same body makeover that the A7 II received earlier this year. 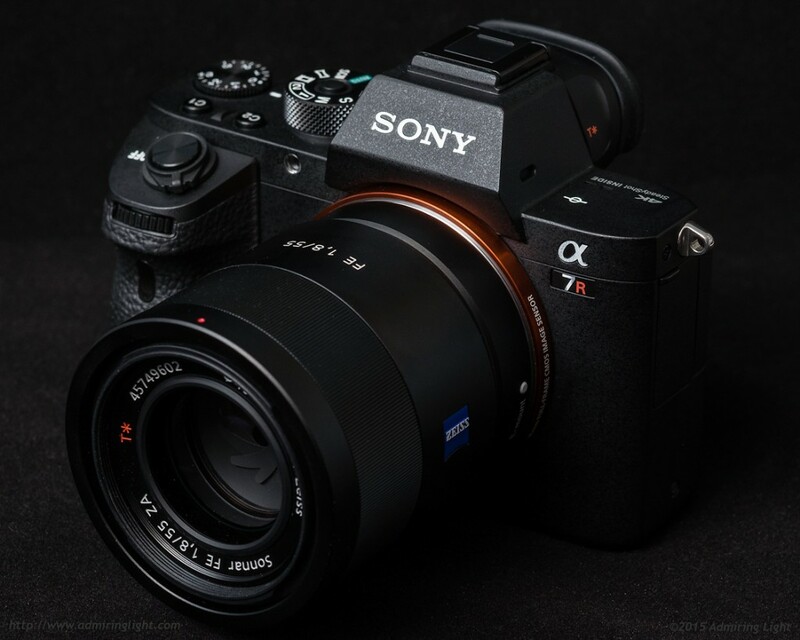 If you’ve used the A7 II, then the A7R II feels identical to hold and operate. The A7R II has upgraded the exterior construction to a more robust all magnesium-alloy construction with a durable matte finish. While this has the great effect of making the camera feel incredibly solid and decidedly like a true professional tool, it has the down side of increasing the weight of the camera body substantially. In fact, the A7R II is nearly 35% heavier than its predecessor, and it can definitely be felt. However, as I noted in my A7 II review, I feel the improvements to ergonomics and control are well worth the added heft. The new body style provides a very comfortable hand grip with the shutter button moved forward onto the grip itself. As a result, the A7R II handles beautifully in the field, despite the heavier weight. The grip is perfectly contoured with a wonderfully textured rubber grip. The dials on the camera are redesigned as well from the original A7 series, and these are a bit more fiddly than the original broader dials. These dials are notably more difficult to operate with gloves, so come wintertime, you may be slowed a bit. The other controls are identical to the A7 II and similar to the original A7 series cameras, and this is a good thing. I also have to remark on the feel of the exposure compensation dial. This is smaller than the EC dials on many other cameras, but the resistance is absolutely perfect. It is just firm enough to avoid accidental movement, but not so firm as to prevent easy use of the dial with just the thumb. It simply feels fantastic to use. 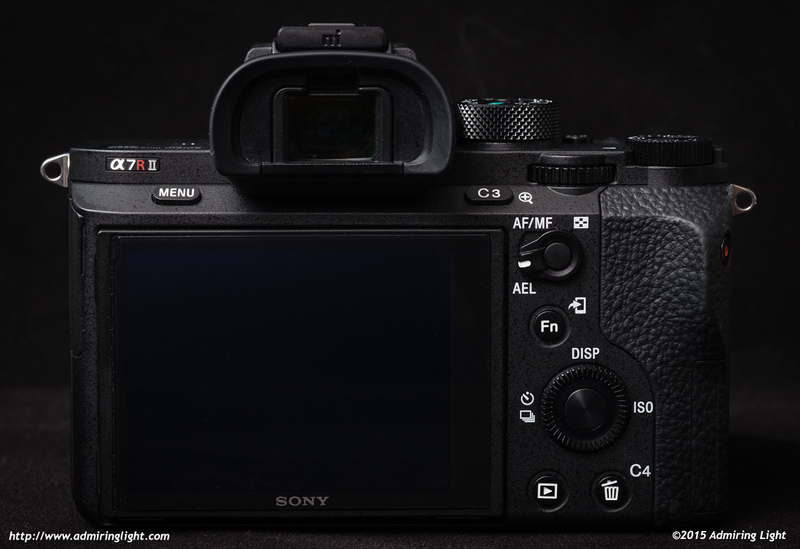 As I mentioned above, the general control scheme of the A7R II is largely similar to the original A7R. The controls are laid out almost identically to those on the A7R with two minor changes. First, with the shutter button now moved forward on to the grip, there is additional room on top of the camera, and Sony has added a second customizable function button on the top plate. C1 and C2 buttons sit in front of the exposure compensation dial, and while they do require a slightly uncomfortable bend of the finger, they are both within easy reach during shooting. What was the C2 button on the A7R is now the C3 button, and it still sits up and to the left of the AF/MF/AEL button, but the angled back plate makes this button easier to reach on the A7R II than it was on the original body. The only controls that sit outside of the main area that can be accessed by the index finger and thumb are the movie record button, which sits on the outside of the right grip and the menu button that sits on the left side of the camera. The menu button location is a bit odd, but it’s not a major issue. I like Sony’s positioning of the movie record button, which provides easy access while making it difficult to press accidentally. 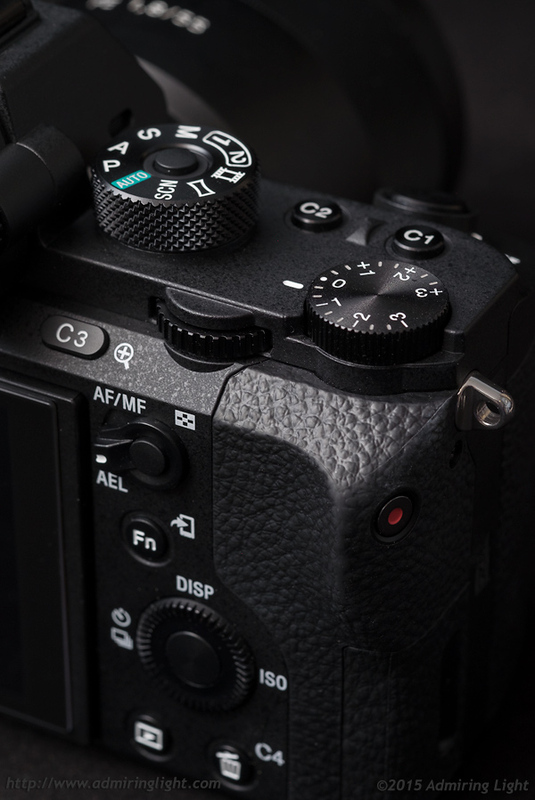 A standard PASM mode dial sits on top of the camera, and in one of the only changes from the A7 II, the A7R II’s PASM dial has a push-button lock that must be depressed to change the mode. While I have rarely knocked the dial on my personal A7 II, this locking feature will help eliminate accidental mode changes entirely. As one who’s been shooting with the A7 II for the past 4 months, the control system of the A7R II was instantly familiar. In fact, I often needed to remind myself that it was a different camera from the A7 II. Sony continues use of their excellently implemented 12 item Function Menu, accessed with the Fn button on the rear of the camera and providing quick access to all the settings you could wish for during shooting. Especially nice is the ability to place quick access for the in-body stabilizer settings, which comes in very handy when shooting with adapted manual focus lenses. I’ll get more into the in-body IS a bit later in the review. The A7R II’s new silent shutter option can also be placed into the Fn menu, though oddly, selecting silent mode doesn’t change the audible focus confirmation beep to silent. Sony also hasn’t changed their tabbed menu interface, which puts a huge number of options into a well-organized interface. I was a huge opponent of the original NEX menu system, but given what I hear from other reviewers, I may be in the minority in actually liking the current tabbed menu system. Frankly, I think it’s great that they didn’t make any changes here. I’ve written up my thoughts on the EVF with manual focus lenses on TalkEMount. Initially I was with you on the problem, but when I got back to the computer and looked at my images, my hit rate with MF was the same as it was before with my original A7. So at least for me, while the change looks weird, uncomfortable, and makes me nervous, it hasn’t hindered my shooting. So I’m slowly coming around to accepting it simply as a different look. I think this is the first review I read that saying the continuous AF improvement over A7ii is minimal. I don’t have A7Rii yet, I am still waiting. Yeah, I looked to see if I was doing anything off, though having had success with my a6000 and even decent success with my A7 II, I didn’t really see that as an issue. However, I can tell you I tried every focus mode, turned it to AF priority, etc. I tested with both the FE 55mm f/1.8 and the Batis 85mm f/1.8. I do test difficult subjects: all of these cameras can easily track subjects that are primarily moving laterally. The differences are when things are moving towards or away from the camera. To be honest, the very best C-AF I’ve used in mirrorless is with Fuji cameras with firmware 4.0 on the X-T1 (and likewise the X-T10). The latest firmware bumped them from pretty good to very good. Their PDAF area is much smaller, but I’ve had great accuracy in tracking, even with lenses like the 56mm f/1.2. Sony’s been a bit more hit or miss in this department, with the a6000 turning in a very good performance overall. That said, the A7R II is a smashingly good camera, and I was very pleased to see the low light AF improvements that are very real on this camera. Thanks for the comparisons to the A7II’s autofocus. I already bit the bullet and purchased the A7II, figuring the saved money could get me a nice lens at the least. I was almost hoping you’d find the A7rII’s AF all around not much better, but alas, now I just have to keep convincing myself that I really don’t need the more expensive camera. Because I don’t. But it really would make me feel all fuzzy inside. Interesting read on the AF. On my A7ii I use flexible spot (small) and continuous low in AFC mode. This gives me good results if s.b. is approaching me. But continuous high is not working properly. Did you experience the same behaviour in both modes? Very nice review with great pics. it’s the first time I write here, but I often read your nice reviews. I have a complete Fuji system, the X-T1 and several lenses, but the new Sony is tempting a lot.. I can’t justify to own both systems, it’s just an hobby, so I am considering a switch. The main reasons: 1) Fuji AF is still frustrating when doing portraits of kids, 2) resolution and IQ for landscape photography. I find the Fuji is great to photograph people, less so for landscape. I like to shoot both..
Any thoughts about the two systems? Are they in competition or in completely different leagues? What would be your choice if you could only own one? First, thanks for the excellent review. I’ve just bought my A7rii (not yet in hands!!! Trembling out of anxiety! )… but something that struck me in not being mentioned in your review was your experience with Canon glass, especially the 85mm 1.8 you used. I’ve read elsewhere that autofocus with this lens is awful, but I’d like to hear your opinion on the matter. Thanks again for your time in charing.